‘These fragments have I shored against my ruins.’ The words are T.S. 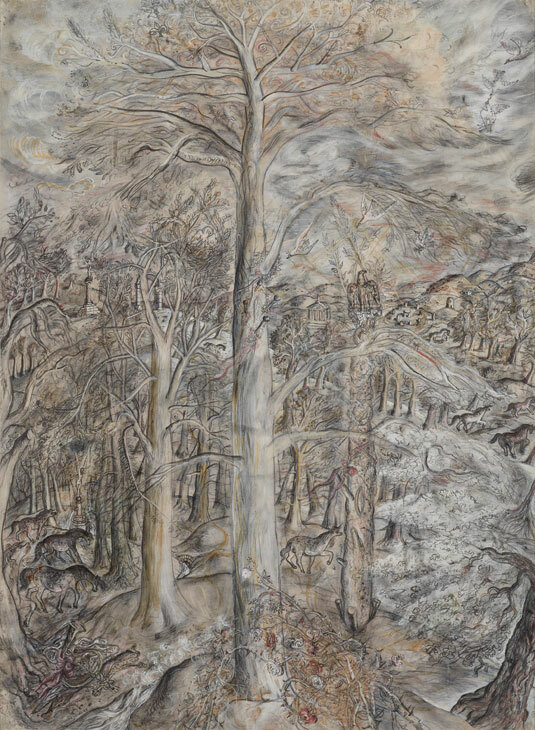 Eliot’s, but the artist who best put them into practice was David Jones (1895–1974). His mature watercolours, in particular, teem with so many details, often drawn from wide-ranging sources, that it requires a Where’s Wally type of patience to acquire an adequate grasp of the images. Such imaginative weavings gradually draw the viewer in, until the barrier, initially created by their strange and arcane nature, evaporates. This does not mean that complete understanding has been achieved. 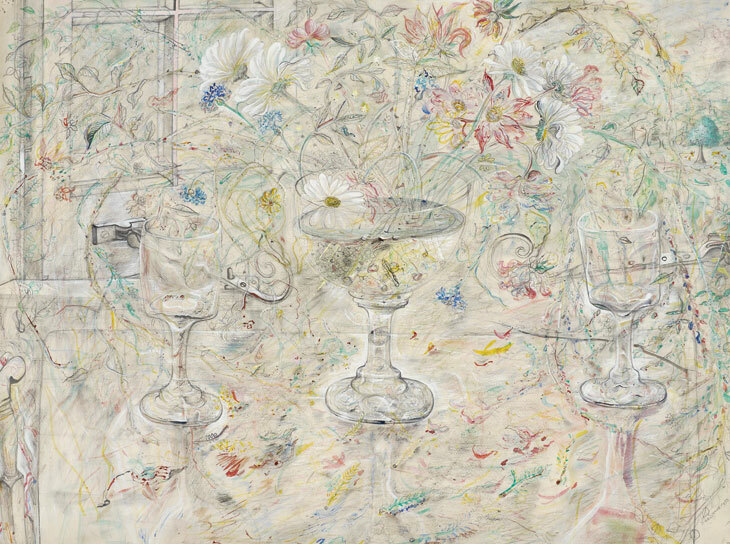 More usually, the viewer has been unexpectedly ravished by the beauty and complexity of such works – among them Flora in Calix Light (1950) and Vexilla Regis (1948), both in the collection of Kettle’s Yard, Cambridge. 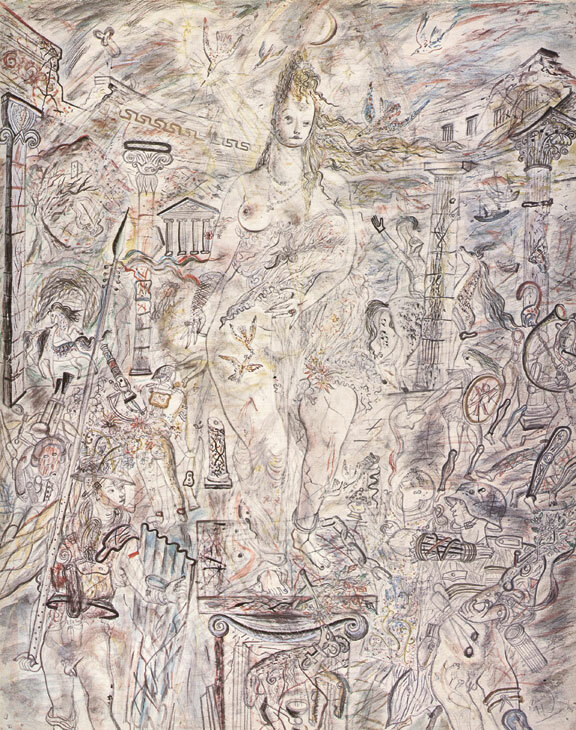 Yet, faced with such crowded and seemingly chaotic pictures, even William (‘Bill’) Stevenson, the psychiatrist who brought Jones out of his most severe breakdown and made possible the writing of his great poem The Anathemata (1952), was left in doubt when shown Aphrodite in Aulis (1940–41). Looking at the Roman, Arthurian, Christian and First World War clutter that floats around the oddly distended naked woman standing on a plinth, Stevenson judged it ‘psychologically unbalanced’. The critical speculation over the many sources feeding into Jones’s art, as well as his unorthodox personal life, make him a fascinating subject for biography. Jones was born an Englishman, in Brockley, Kent, but had Welsh antecedents on his father’s side. On his first visit to Wales, his father turned to him and said, ‘Well, here you are now’, not realising how perceptively he spoke. It was not only the ‘otherness’ of Wales that appealed to David Jones, but the way that it immediately took him back into the past. He became obsessed with Welsh history, poetry, and the wrongs done to this country by the English. Few visitors to Canterbury Cathedral whack the effigy of Archbishop John Peckham, but Jones did, hurting his hand in the process – for Peckham was the man who had helped Edward I conquer Wales. Arthurian legends and Roman history drew him into a territory that left him out of step with the modern world. It is astonishing to learn, in Thomas Dilworth’s new biography, that Jones saw more active service in the First World War than any other British writer. He was sent home in 1916 after being shot in the calf, the bullet having narrowly missed his bone. When he returned to the Somme he found that the war had changed. The visible signs of this were the increase in artillery and munition dumps. During concentrated bombardment, this meant that the intervals between explosions disappeared, for war was now a matter of wholesale mechanical force. Jones’s regiment was to initiate the battle of Passchendaele, and one of his tasks was to map no-man’s-land. Thomas Dilworth suggests that this experience, after long gestation, re-emerged in his watercolours, with their wandering lines, broken perspectives and irregular patches of colour. After the war, like many artists Jones sought new beginnings by going back to the old, and studying certain works in the National Gallery. He also re-enrolled at art school, first in Camberwell and then at the Westminster School of Art, before joining Eric Gill’s Guild of St Joseph and St Dominic in 1922 at Ditchling. His initial decision to apprentice himself to a carpenter proved a mistake, for it was etching and wood-engraving at which he succeeded. Dilworth gives a convincing account of the father-son relationship between Gill and Jones. The latter became so involved with Gill’s family that he became engaged to Petra Gill, the artist’s second daughter, although he never married her. This was the beginning of a long history of close but ultimately abortive relationships with women. Most seem to have been passionate friendships, attraction leading only to severe pain when the young woman in question married someone else. Dilworth has long been regarded the leading authority on Jones. He not only brings years of research to this biography but also great depth of understanding. He makes vivid Jones’s life and character. His book also complements in many places the achievement of Ariane Bankes and Paul Hills, who in 2015 curated a major Jones exhibition at Pallant House, Chichester, and produced a handsome monograph on his visual art. Their observation that Jones’s art evolved through ‘repetition and revisiting and circling round and returning to the same theme’ is upheld by Dilworth, who takes us still further into the lexicon of signs that Jones persistently reshuffled to create new meanings. This is nowhere more apparent in Jones’s work than when he deals with the Mass, for him the supreme art form, perfected by centuries of usage. Dilworth reminds the reader that Jones regarded all art as sacramental; such a belief may seem simplistic, but behind it lay a mind seamed with a sophisticated understanding of theology. Jones was frequently ill and perennially hard up; and the nervous breakdowns began in his late 30s. This much is familiar, but many additional details are given here. Towards the end of his life, when two men arrived to explain that a state pension, as yet uncollected, was rightly his, Jones initially sent them packing. He distrusted all financiers. For years he made visitors tea by slowly heating water in a saucepan on an ineffective electric ring – until a young woman, observing the procedure, went out and returned with an electric kettle. At the end of his life, he moved into a bleak residential hotel on a busy road, but was heartened to see trees in the back garden. Before long the garden was tarmacked and turned into car park. For Jones this was symbolic: the ‘utile’ again winning over the imaginative and creative. Momentarily the macadam seemed to represent everything in his work he had quietly but fiercely resisted. David Jones: Engraver, Soldier, Painter, Poet by Thomas Dilworth is published by Jonathan Cape.